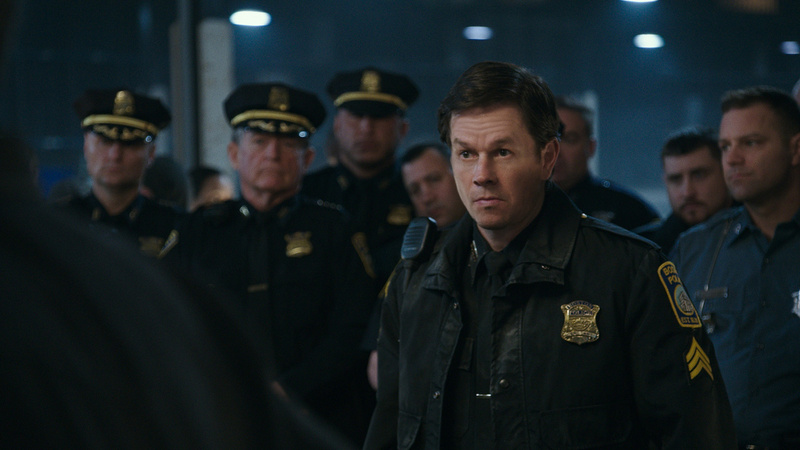 Academy Award nominated Mark Wahlberg stars in and co-produces Patriots Day. “Mark and I spent time talking about making a film that is not overly active or suspenseful. It could have turned out to be a thriller…it was never our intention exploring how a community comes together, exploring the theme of love, inclusiveness and support,” said Peter Berg (Deepwater Horizons) the director of the bio-picture based on the book “Boston Strong” by Casey Sherman and Dave Wedge of the 2013 Boston Marathon bombing. 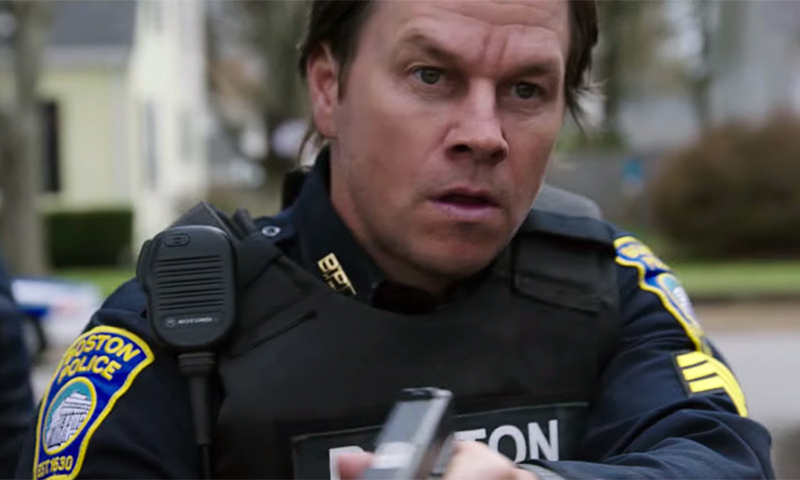 Every role was based on a real life character except for Police Officer Tommy Saunders played by Mark Wahlberg (Lone Survivor). The Officer limped his way through the entire film because of a knee injury but he did not let that stop him from running off and becoming the hero of the day. It was a less than stellar assignment the officer receives that day – security for the end of the line for the Boston Marathon. Still when that moment came Officer Tommy and the other law enforcement officers proved to the world how strong Americans are in the face of evil. Wahlberg’s performance will show you how love can win when faced with evil. His performance will inspire you, those who think they are ordinary citizens, that you too are extraordinary and can take action when faced with evil – even when physically weak. Patriots Day also stars Academy Award winner JK Simmons (“Law & Order,” “The Closer”) as Watertown’s Police Sergeant Jeffrey Pugliese; Golden Globe winner John Goodman (The Flintstones) as Boston Police Commissioner Ed Davis; Michelle Monaghan as Carol Saunders (“True Detective”) wife of Officer Saunders (Wahlberg), and Golden Globe and Emmy Award winner Kevin Bacon as FBI Special Agent Richard DesLauriers – all real people. Written by Pete Berg, Joshua Zetumer and Matt Cook Patriots Day starts at the beginning of the day for a host of people leading up to the tragedy, the investigation and the capture of those responsible in a way which provides the film with a variety of lens the audience can see through so they can associate with what was about to happen. Even the two brothers’ lives were shown as a normal family – but one that hates with a vengeance anything and anyone American. The script also showed that not only Americans were affected that day when they included the car-jacking of new arrival to America, Dun Meg played by comedian/actor Jimmy O. Yang. The two Soviet born brothers Tamerlan Tsarnaev played by Themo Melikidze and Dzhokhar Tsarnaev played by Alex Wolff (“Mr. Troop Mom”) came across clearly as misguided young Islamic radicals – I kept hoping they’d come to their senses and see love and not hate. What transpired that day, the time leading up to that day and the days after bring a message that this could be your city, your community and your police commissioner. Will you put aside differences and unite to fight the evil foe as the “Boston Strong” did? Patriots Day will inspire you to take action. Produced by Mark Walhberg, Scott Stuber, Dylan Clark, Stephen Levinson, Hutch Parker, Dorothy Aufiero, Stephen Stapinski and Michael Radutzky Patriots Day is a Closest to the Hole/Bluegrass Films production arriving in theatres January 13, 2017. You can log onto www.PatriotsDayFilm.com for the trailer or for more information. SYNDICATED COLUMN: Eunice Moseley, has an estimated weekly readership of over ¼ million with The Pulse of Entertainment. She is also a Public Relations Strategist and Business Management Consultant at Freelance Associates, and is Promotions Director (at-large) for The Baltimore Times. www.ThePulseofEntertainment.com. EVENT: 18th annual “Uplifting Minds II” Free Entertainment Conference (Baltimore Sat. April 22, 2017 and Los Angeles in October, 2017). Entertainment Business panel and national talent showcase competition (vocal, songwriting and dance) with over $10,000 in prizes. www.UpliftingMinds2.com.